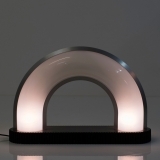 An bow shaped table lamp made of methacrylate and aluminium on a black base. 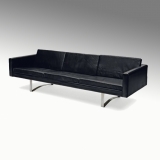 Afra & Tobia Scarpa (1935-2011 & 1935-) Soriana A brown velvet covered and metal framed sofa. 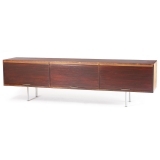 A brown velvet covered and metal framed sofa. 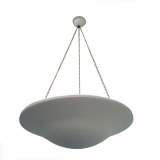 A set of three beautiful white colored plaster pendant lights of circular shape, held by three adjustable brass chains. 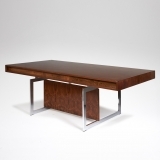 Signed, dedicated and dated 1942 underneath. 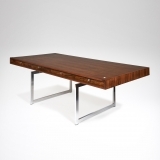 BODIL KJAER (b.1932) A BEAUTIFUL EXECUTIVE DESK A free-standing rosewood rectangular desk with chromium-plated steel frame, top with four integrated drawers. 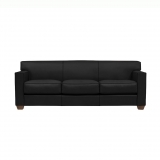 Manufactured by E.
A sofa and two armchairs en suite. 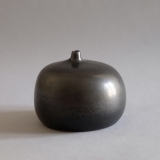 Georges Jouve (1910-1964) A «Pomme» vase An apple shape ceramic vase with a black cover. 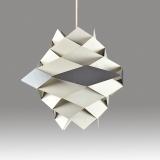 Signed underneath «Jouve» and artist’s cypher «Alpha». 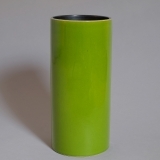 Georges Jouve (1910-1964) A great «Cylinder» vase A green glazed ceramic cylindrical vase, with a black covered interior. 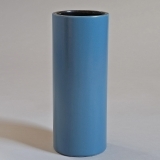 Ceramic cylindrical vases of different sizes and colours. 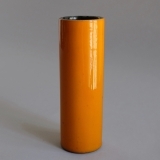 A yellow-green glazed ceramic cylindrical vase, with a black covered interior. 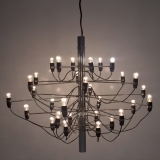 A cylinder shape plated metal chandelier, the central stem issuing thirty arms each supporting a light bulb. 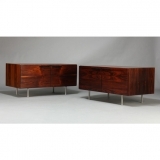 With a burgundy lacquered aluminium structure, the interior made of beige ABS. 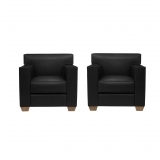 A set of seven carved oak chairs. 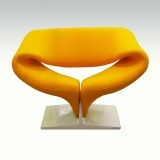 The seat cushions covered with orange wool fabric. 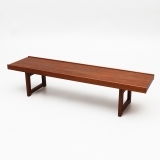 The frame made of teak, the seat and back rest covered with brown suede. 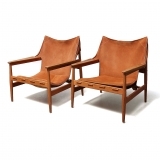 Jean-Michel Frank (1895-1941) & Hermès «Confortable» A three-seater sofa covered with black smooth calfskin on a natural beech structure on solid oak trapeze feet. 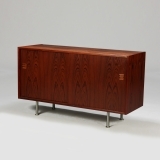 A piece unique low sideboard of Brazilian rosewood. 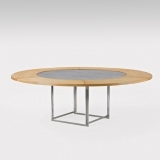 Chair with orange wool upholstery over a foam-covered metal frame on a light grey lacquered base. 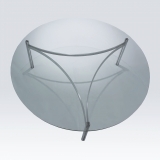 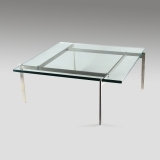 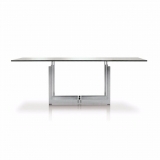 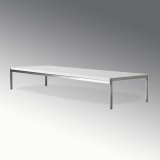 A square coffee table with a glass top on a four legs matte chrome-plated steel stand. 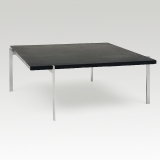 A square coffee table with a slate top on a four legs matte chrome-plated steel stand. 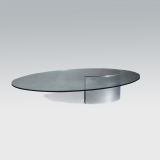 A rectangular PK63 coffee table with a white marble top on a four legged matte chrome-plated steel stand. 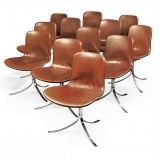 A beautiful and rare set of 12 PK9 chairs, the seats upholstered with cognac leather on three stainless-steel legs. 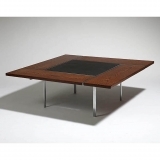 A square coffee table, frame of steel, wengé and slate table top. 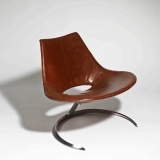 Chrome plated steel with brown leather covering. 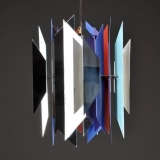 A pair of vertical metal blades pendant lights, chromed and white, blue and red lacquered. 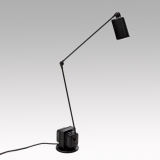 An articulated black metal table lamp on a cubic transformer. 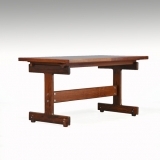 A rectangular teak side table on two pairs of feet joined by a stretcher. 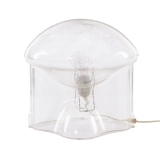 A molded transparent bubbled glass table lamp the oval stretched body evoking a medusa.